It’s at about 2:00am that the cold really starts to get to you. Coupled with the incessant beeps of a nearby truck in the alley that seems to be perpetually moving in reverse, and the fact that there’s nothing between you and the ragged asphalt of the alley but a layer of flattened cardboard, it becomes tough to sleep. In sub zero temperatures I’ve found that laying on my stomach is most effective for keeping me warm, but it leaves me vulnerable. Luckily, when I participate in one night of chilled, sleepless misery on the streets of Vancouver, there’s a team watching over me with water, tea, coffee, and extra blankets. No matter how miserable I’ve been in the middle of the night, during my last 3 years of the Covenant House Sleep Out, it absolutely pales in comparison to what local youth have to go through. Every day. Every night. But I just signed up to Sleep Out for the 4th year, because this small act has a big impact. 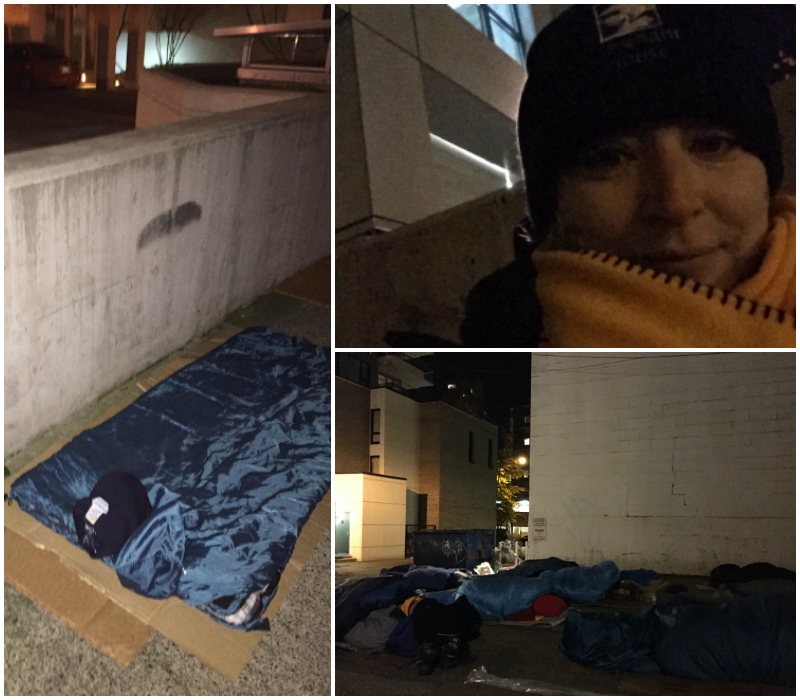 The Covenant House Sleep Out takes place at Covenant House locations across the world, supporting local homeless youth so that they don’t have to spend another night outside. Last year after I set up my “bed” in the alley, I hopped on Twitter and connected with people in New Orleans, Dallas, and New York who were also heading outside for their local Sleep Out. 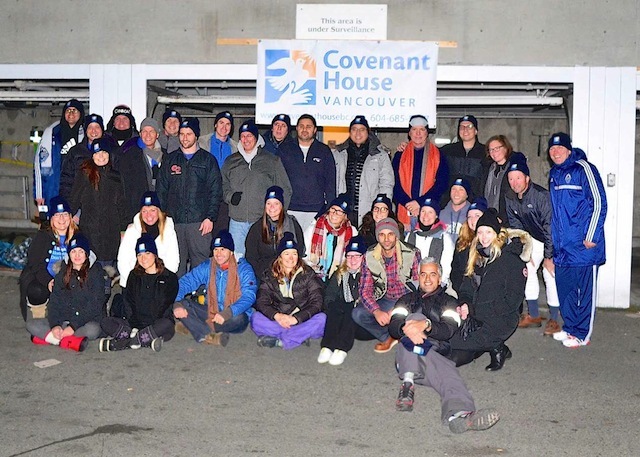 This year on November 17th, executives, public figures and well connected leaders in our community will once again sleep outside for one night in solidarity with those youth who may face many more cold, lonely nights until they find their way through the doors of Covenant House Vancouver. From Los Angeles to New York, Toronto to New Orleans and in other major cities across North America, participants will raise funds from their companies, colleagues, friends and family to support the life-changing work that is being done to help young people leave the streets and begin new lives. These leaders will draw the attention of the larger business community and our nation to the problem of homelessness among young people. Covenant House Vancouver provides support on various levels: Crisis Shelter, Drop in Centre, Street Outreach, and Rights of Passage. Before we head outside on the night of the Sleep Out we usually split off into groups and speak with youth clients and volunteers. It is always encouraging to meet kids who went from being homeless, to the crisis shelter all the way through to Rights of Passage, Covenant House’s program that prepares them for the bigger world. Those in Rights of Passage actually pay (an affordable) rent and get full access to programs provided that they have a job or they are in school. They end up learning basics like grocery shopping and budgeting, and once they are through the program (6 months to 2 years) they are supported when they eventually move out, even welcomed to return for the weekly communal dinners. The care just keeps going to ensure the youth become self-sufficient, gainfully employed, successful individuals. In 2013, my first Sleep Out year, over 600 participants around North America slept out for their local Covenant House. They raised over $3 million. Vancouver had 5% of the participants but raised 10% of the funds. This will be my fourth Covenant House Sleep Out and I would love your support. $10, $20, $50, any amount you can donate directly to Covenant House through my campaign page would be of significance. Whatever amount you can spare can truly make a difference. Thank you very much for your consideration and follow me on Instagram and Twitter for updates on November 17th when I sleep out on the street again. Follow Covenant House on Twitter and Facebook for much more information.